The KCI Expo Center is the perfect place for your meeting or conference. We have facilities to suit business or social events, from large celebrations, award ceremonies, family get-togethers, a wedding party, or private dining. KCI Expo Center provides a choice of catering to suit your needs, whether it’s a buffet or a sit-down meal. With the airport and hotel nearby, the location is convenient for everyone. Along with all the amenities and full-service team, KCI Expo Center provides the most hassle-free meeting experience possible. One question many event planners ask is “how do I know which room setup style is best for our type of meeting or event?” Below is an explanation of each meeting room set-up and how it would work within the KCI Expo Center. 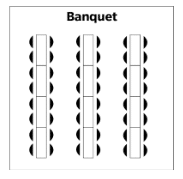 This style is set up in rows of chairs without tables, arranged with all participants facing towards the front of the room, typically divided in the center and may include side aisles. 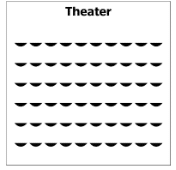 These classic features make auditorium/theater style more than appropriate for a short lecture or larger groups in Kansas City that do not require extensive note-taking. Usually, this arrangement of event space is best suited for mass meetings, annual general meetings needed near the airport, and product launches to achieve maximum seated capacity. This style has round tables arranged throughout the room attendees being seated around the entire perimeter of each table, making it appropriate for conference events entailing meals and small group discussions. The grouping of tables in this way makes meetings at the KCI Expo Center ideal as it allows the movement of participants as well as the service of food. Events where banquet style is used includes gala dinners, wedding receptions, and award nights because of their ease of interaction. 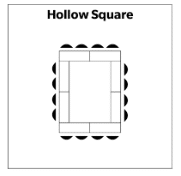 The Hollow Square Style is set up in an arrangement where tables are arranged in a square shape with chairs along the outside of the tables looking towards an empty center. This type of style is the best meeting space option when there are is a group with fewer than forty with a group leader or panel seated at the head of the setup. It is optimal for there to be encouraged interaction between participants when this set-up is used. 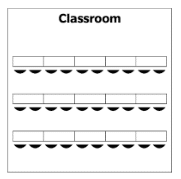 The Classroom Style can also be referred to as “the school style” by some and has chairs and tables arranged in rows with all participants facing towards the front of the room. This set-up can be used when you want the attendees to study handouts, use their computers, or takes notes during the meeting event. It is especially useful for training and long lectures or clinics for all types of conferences. When utilizing the space at KCI Expo Center, keep in mind the Classroom Style. 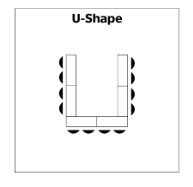 In order to attain the U-Shape Style, conference tables are arranged in a large U with open space in the middle. Attendees are seated around the outside, facing the center of the U. Another way to achieve this same set-up is to use a round table and place the seats around, leaving one opening at one end for presentation purposes. This arrangement is used best during meeting events where the focal point is in the enter and/or interaction between participants is encouraged. The opening of the U also allows presentations that are visual to be seen by everyone, which only aids the group interaction and discussion aspect. This style appropriate for small annual general meetings, conferences, and workshops. Our 10 meeting rooms range in size from 260 sq ft to 6745 sq ft and can accommodate 10 to 650, perfect for a range of conference and banquet functions held in Kansas City. The rooms can be rented individually or you can work with our Client Services Manager to tailor a setup just for you. In addition to our meeting rooms, we offer the story Grand Lobby that adds Kansas City flair for your registration needs, tabletop displays, and receptions.